Humor research inherited factor analysis from personality psychology. While factor analysis succeeded in validating models of personality, known to be generally constant with age, little or no significant cross-correlation was found with measures humor, known to change systematically over the age of adults. It is speculated that factor analysis does not differentiate sufficiently between humor types because age is a confounding factor, therefore an alternative mode of analysis is sought. Signature analysis is a statistical technique often used in astrophysics and electronic warfare in order to identify the type of radar target by matching the spectra of its reflection with typical signatures. In an analysis of on-line humor appreciation scores, the responses to individual humor lines were treated like the spectra of a radar reflection; the age profile of each humor line was compared with four typical age trend profiles. The graphical representations of signature comparisons showed remarkable compliance with age trend typical profiles, for the most part it was immediately possible to see which line and which age group had typical or atypical average value. And where typical values were identified then the proximity to meeting the Cramer-Rao lower bound (best estimator limits) was systematic and strikingly small. On plotting the distribution of the errors, it was clear that age trending offered a valid typology for humor; the distribution showed a clear and significant spike over roughly normal distributions very close to the zero error match point for all four age trend. 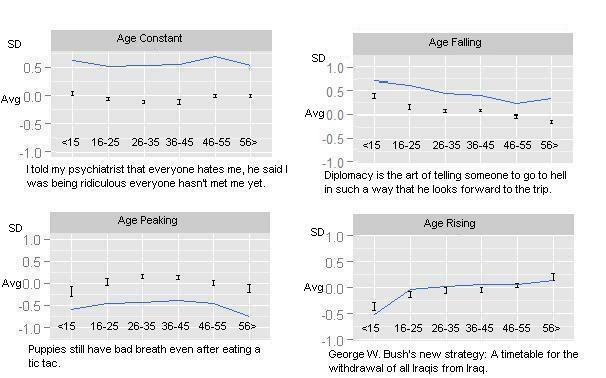 Signature analysis leaves no doubt that age trend profiles are good estimators of types of humor.